This article is from the WSSF 2004 AFRMA Rat & Mouse Tales news-magazine. Siamese Rats & Hairless Rats; Inherited Calico Traits; Tri-Colored Mouse? ; What Will They Produce; Making Two-Colored Mice; Wants Mutant Rats. Q A new girl at my place of work also likes rats. She had one that developed tumors and had to be put down, then her mother rescued her current rat from being killed by some cruel people at her place of work. I guess he’s very affectionate and is white with red eyes and black on his nose and on his behind. I told my newfound rat friend that her rat must be a Siamese. I don’t think there are any around here, at least I haven’t seen any in the pet shops. I had to go all the way to Milwaukee to get my rats. Last year, Petland had some Hairless rats, but I was afraid to get them because they seem so fragile! They seem to need much more care. A Himalayan rat owned by Mayumi Anderson. Notice the almost white body color and lighter points compared to the Seal Point Siamese on this page. A Your friend’s rat does sound like a Siamese or Himalayan. I’m not surprised she found one. They were very popular in the pet shops for a while and just about every commercial breeder mixed them into their colony. The Siamese were first imported from England in 1983 (AFRMA was responsible for bringing them in). Unfortunately, a few pet shops got hold of them and found they could sell them for a lot of money. All of a sudden everyone wanted one and huge numbers were produced with nasty, aggressive temperaments (many ended up attacking their owners) so they developed a reputation for being mean. That was the end of them as a fad, but many still crop up in pet shops. It’s not unusual to still find them with poor temperaments, so I’m happy to hear that your friend’s appears to be fine. Siamese rats are my “true love” among the rodents, and they are the reason I got involved with them in the first place. A Seal Point Siamese rat “KK1584-A Play It Again” owned by Nichole Royer, bred by Karen Robbins. 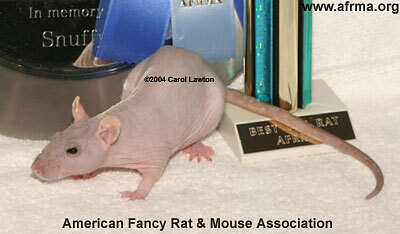 A Hairless rat “Happy” owned by Gina Hendricks. She won Best Pet Rat at this show. Q For the past 5 or 6 years a friend and I have been managing a mouse colony that produces about 2000 mice per year. They are of all colors, and long haired, short haired, silky, and wavy haired. I was interested in finding more information on how some of these traits are inherited. Specifically, over the past 6 months we have had four mice born that we describe as calico—they are black, white, and tan. Since these are the only ones we’ve seen out of probably 10,000 that we’ve produced, we were curious about how rare this is and what the genetic mechanism is that causes it. Any information you could provide would be greatly appreciated. Q I have several mice of which I breed. I recently discovered that I have a female mouse and it is tri-colored. I have never seen one before. Usually I get spotted or two-colored ones, but never three. My question is are these common or not. Would this be considered show quality or not. A Spotted Tan mouse (this is a Broken Merle with the Tan gene) from Virginia Pochmann. Note the orange by the back leg. This is where the top color “ran” onto the bottom and because of the Tan gene was changed from the Black, to the orange of the Tan. A Black Broken Merle mouse owned and bred by Carissa Cosley. This has the appearance of being “tri-colored” with the patches of Roan, Black, and White. If the third color is only on the belly area, then you have Spotted Tans. Spotted Tans can come in Banded, Dutch, Broken Marked, Even Marked, Variegated, or Broken Merle. Basically, these are spotted mice that carry the Tan gene and any colored areas on the belly are changed from the original color to orange, giving the appearance of “tri-colored” mice. Another way to get “tri-colored” looking mice is if you have Merle mice (Roan mice with solid patches) and introduce the spotted gene, then you will get Broken Merles (colored areas consisting of Roan, solid color, and white). 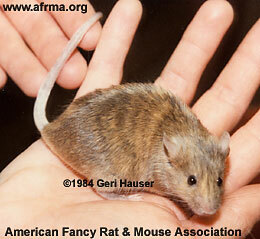 Or, if you have Brindle mice (usually Fawn colored with dark “stripes” similar to tigers or Brindle dogs, etc.) and introduce the spotted gene, you will get Broken Brindles (not considered show quality but pretty pet mice) with the Fawn, black stripes, and white. 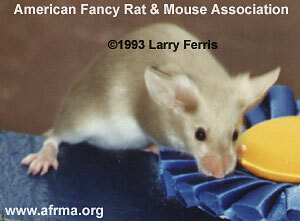 A Tri-color mouse from 1980 owned by Linda Huscher. Note the large Black, Beige, and White patches. 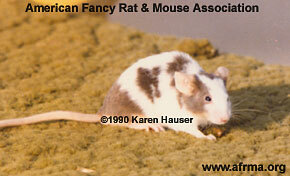 True ‘Tri-Colored’ mice will have the different patches of color on their topsides similar to calico cats. Unfortunately, these mice are usually somatic mosaics, meaning this effect is only seen on that one animal and will not pass down in the genes so you cannot reproduce it. If your mice produce more of the same of what they are, then you have one of the above possibilities rather than a true Tri-color. Q I am the proud owner of five rats. I am about to breed two of my rats, Zinc and Rorchatz. I have tried to grasp ratty genetics, but alas, I cannot understand it at all. Would you be able to give me an idea what markings these two would produce. The male is a double Hooded Black Variegated (Down Under Hooded, Ed.) The female is an off white pink-eyed white. Rat and Mouse Association, Victoria Inc. http://www.ratandmouseassociation. 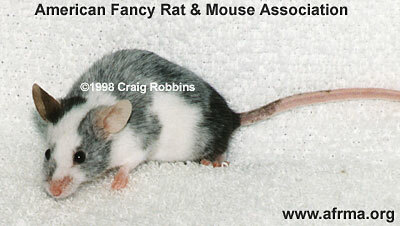 Rat & Mouse Association (Vic) Inc.
Q I am having trouble breeding my mice to produce two-colored offspring. Is there some obvious reason why it’s not working. I have many different colors and was wondering if you can give me some tips on how to make it work. The first thing to understand is that breeding two different colored mice together will not give you baby mice who have both those colors on them. That’s just not the way it works. There are several very common and easy-to-find varieties which give you mice of more than one color. None of these varieties are things that you can “create” from scratch but they are all commonly found in pet stores. A Beige Fox Satin mouse owned and bred by Nancy Ferris. 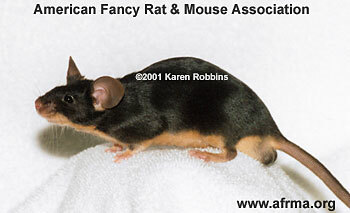 A Black Tan mouse owned and bred by Karen Robbins. Tan and Fox Mice: These mice have a colored top and either a bright orange underside (Tan mice) or a white underside (Fox mice). If you breed these mice to most other colors, you will get some babies who are Tan/Fox. 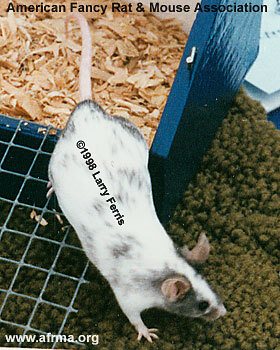 A Fawn Brindle mouse from 1984 owned by Karen Hauser. Brindle mice: These mice are orange with black streaks all over their bodies. Ideally they have clear distinct stripes. Bred to any other color they will produce some youngsters who are brindled. Black Broken Marked Std. owned by Karen Robbins, bred by Ann Quinn (Mile High Mice). Spotted mice: These mice are white with colored spots on them. This gene is recessive, which means a mouse has to get the gene from each of its parents in order to be spotted. If you only had one spotted mouse you would need to breed its kids back to it in order to produce more spotted mice. A Spotted Tan mouse from 1980. Owned by Karen Hauser. Spotted Tan Mice: This is the combination of spotting and Tan, and gives you a very pretty animal who has spots of one color on top, Tan spots on the bottom, and white. Some people think these are “tri-colored” mice but they are not. It’s simply the combination of the spotting gene and the Tan gene. 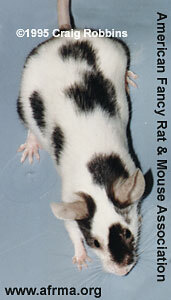 A Black Variegated mouse owned by Denise Deen. Variegated Mice: These mice have solid colored spots on their heads and rumps, and a sprinkling of colored and white hair on their backs. If you breed them to any other color, you will get some Variegated babies. Q Hello! I’m a Chihuahua dog breeder from Finland. I started a rat hobby. In Finland we don’t have Dumbo, Hairless, Tailless, Odd-eye, or Dwarf rats. I just love them! I would like to have Hairless, Tailless, and Dwarf. Is it possible for a breeder to send those rats to Finland? How much will one rat cost? I think that they must need to send at least 10 or 20 rats. 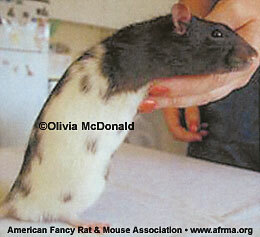 A A few years ago AFRMA shipped Tailless and Dumbo rats to Belgium. As far as I have heard, the Tailless line was doing well, and there are Dumbo here and there about Europe, so I think your best course of action would be to contact breeders and clubs in any of the local countries except Germany, as they frown on “Mutants” there. 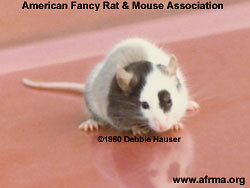 Try the International Rat and Mouse Directory or IRMD as there are many breeders all over the world listed. You can also get in contact with the Finnish Fancy Rat Society to find other breeders that may be interested in the same rats you are and would want to work with you to try and bring these into your country. 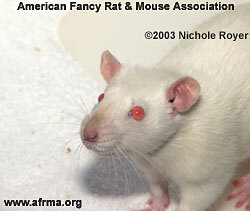 I do not know of any breeders of Dwarf rats on the west coast of the USA. There are breeders in the Central and Eastern states. As far as I know, Dwarf rats have shorter life spans and are much more prone to illness than other rats. Most of the breeders I know (all across the USA) do not breed them or recommend that they be bred.